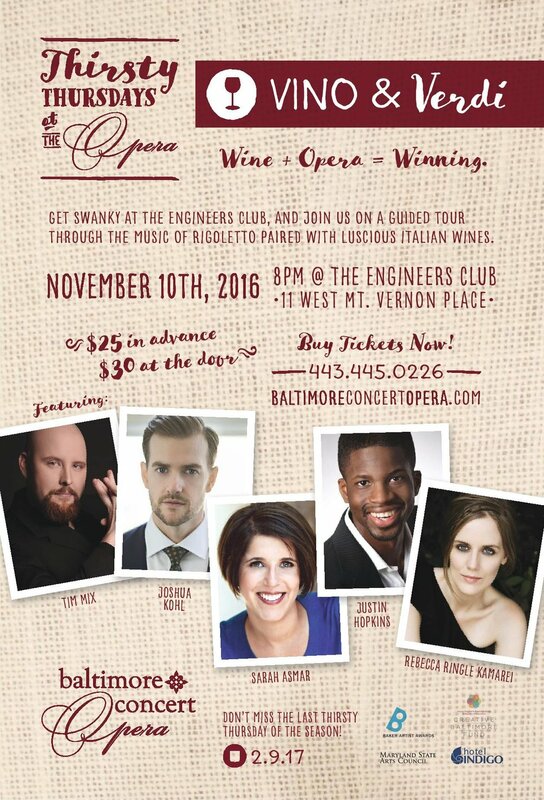 Baltimore Concert Opera continues its popular new performance series this season: Thirsty Thursdays at the Opera. In Vino & Verdi, luscious Italian wines will be paired with top-flight professional opera singers who will perform operatic highlights from Verdi's opera Rigoletto. The same cast will perform the full opera in concert at BCO the following week on Nov 18 & 20. Vino & Verdi will be a guided tour through the opera, featuring large sections of the music, energetic commentary and interesting facts about the tragic opera Rigoletto and its fascinating composer, Giuseppe Verdi. The event will be a casual, relaxed evening in the beautiful Grand Ballroom of the Engineers Club in the heart of Mount Vernon. This event sold out last season, so be sure to get your tickets early! Details: $25 ticket includes live music and tastings of 5 wines ($30 at the door). Cash bar will be open if the drink du jour isn’t your thing.